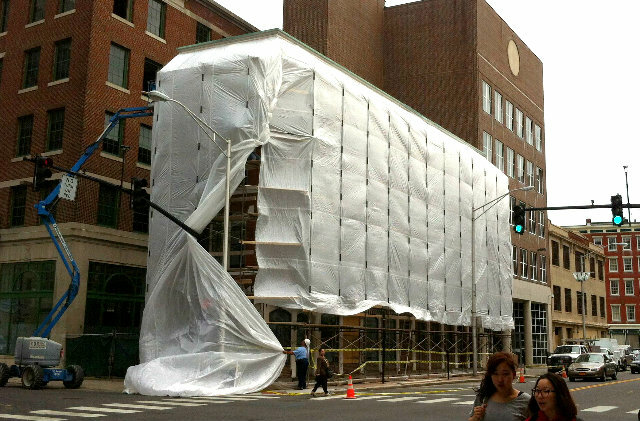 Last month the Old Narragansett Hotel Garage was wrapped in plastic and now looks gorgeous! Today the adjoining Teste Block Building is getting wrapped and I can’t wait to see what it looks like when the wrapping comes down. All this building wrapping is part of an on-going project to convert all the buildings on the block to residential use. My understanding is the Teste Block will have a restaurant on the ground floor with a glassed in area at the back (along Weybosset Street). My plan has always been to buy the Teste Block myself after I won the Powerball. While I’m disappointed to have never won the Powerball and bought the building, I’m excited to see it getting cared for. Yep, I live right across from that garage on Orange Street above Congress Pub that was just unwrapped. They are putting windows in this week. We are almost the only residential on Orange Street at this point, but you are correct that that tall building will be all residential except for the first floor which will be a high end steak house or so I’ve heard from our building owner. I can whole heartedly say that it is nice to live in an up and coming area, but the construction sound for over a year is growing old! I look forward it to being completed. Hey Jef, I just noticed some lovely fencing around the faÃƒÂ§ade of the Arcade (Weybosset street side). Do you know if anything interesting is going on?